In the summer of 1969, between my junior and senior years in college, I went to Haystack. This was the summer of “One small step for man,” when the astronauts walked on the moon in July. I arrived as a jeweler and left as a fiber artist. What happened? Walter Nottingham. The jewelers were having fun, but the real action was next door in the Fiber Studio. These artists were up working and partying till 3 and 4 in the morning, listening to Bob Dylan and blissfully cranking out work. One night, Walter gave a talk on the Magical, Mythical Qualities of Fiber. He showed groovy slides of his student’s work. I remember one so vividly. The artist fabricated a quilt into which she had a sewn a secret interior pocket where she hid a lock of her lover’s hair. It was a secret that nobody else knew. I was sitting there with my mouth hanging open, and my eyes as big as saucers. This must have been my introduction to the notion of revealed and concealed. After the talk, Walter came over to me and said, “Your hair is so black, mind if I do something with it?” Imagine being in a weaving studio, with bins and bins stretched out across the length of the room, full of yarns, all arranged by color, a feast for those of us who love color and texture and organization! My hair was cropped pretty short. He took little strands and wrapped my entire head with every color yarn possible. I looked like I had a gazillion tiny palm trees all over my head. That was the end, or should I say, the beginning of me! I was hooked, gonzo. I was a now Fiber Artist. Over the years, I have heard other say that they, too, were seduced into the fiber world by Walter Nottingham’s charms. And then there was the Prince Among Men, Fran Merritt, the director of Haystack. I can’t say enough about the man. Kind and gentle, a very special man, one of the most fabulous people that you would ever want to meet. He had vision, knew everyone, and was full of wisdom. During one of sessions that summer, Jack Lenor Larson was there, weaving in the sun, out on the deck with steel cable. I returned home to my senior year at Cal State Northridge, which we then lovingly called Valley State (fer sure, totally), only to take every textile class they offered, with such lovely teachers as Mary Ann Glantz, and Bea Colman. I arrived at UCLA in the fall of 1971 for graduate study in Design. In the previous year, I graduated from Cal State Northridge, got married, and worked in our family business, while my husband finished law school. In another entry, I will delve into the family business, Billy Woolf, House of Motion Picture Accessories. We supplied furniture, and just about everything imaginable, to the movies, theater, photo shoots and TV commercials. When I came to UCLA, it was in October of 1971. I felt as though I had magically arrived at the perfect place. The exhibit Deliberate Entanglements had just opened at the Gallery at UCLA. Exhibiting in this show were the likes of Sheila Hicks, Jagoda (you must come to my villa in Dubrovnik) Buic, Magdalena Abakanowicz, and a list of fiber stars from Europe, South America and the U.S. like you wouldn’t believe. And if that were’t enough… a retrospective at the Pasadena Art Museum, now the Norton Simon Museum of Eva Hesse. Holy Toledo! In those days, the artworks were enormous installations, (we called them “environments”), room size, gigantic. I was blissed out. I remember sitting on a courtyard bench at UCLA outside the gallery in the warm October sun, thinking OMG I am in the right place at the right time. My classmates at the time were, Barbara Yamadera, now Barbara Cabot, Yael Bentovim, Maren Hassinger, Kristine Dey, Carol Mondt, and Holly Burgin. Many of us have changed our names, including me. In those days, I still had my given name Debbe, which I changed to Daniella, and my married name Moss, which I changed back to my maiden name, Woolf. Our instructor was Bernard Kester. He knew everything and everyone, and was an aesthetic wonder. He was a Mick Jagger look alike, with big lips. I was terrified of him. He was intimidating and imposing for a slight guy. He used to say things like, “It’s very well what you’re doing with your hands and arms to describe your project, but I have no idea what you’re talking about.” It took me about 6 weeks to get un-intimidated, a huge turning point and relief. I think he saw a certain raw talent in me that he could shape and refine. He took me under his wing in a particular way, for which I am grateful. He’d chat with us about our assignments in our little weaving studio on Sunset Boulevard, and then say to us, Now ladies fly to your looms. I graduated in 1973 with a Masters Degree in Design with the sub category Textile Structures. I had my MA show down at the Faculty Club building on Sunset Blvd, at UCLA. I exhibited three pieces that were enormous. The forest, the dome and a series of arches in space, crocheted of miles of picture framing wire. All my pieces were crocheted, using many, many miles of elements. My dream then was to get my first art commission from an architect or designer. I thought I’d die if I didn’t have one from my grad show. Well I didn’t, and I didn’t die, and it actually took several years for the first commission. Funny how, after a while, the excitement waned and it became not such a big deal by the time I did receive my first commission. Forest: This piece was in the 1975 Lausanne Tapestry Biennial, 10 x 10 x 10 feet, 600 pounds of crochet sisal, jute and manila fiber. When I started school, sisal jute and manila fiber was 30 cents per pound. Two years later when I graduated, they were a dollar a pound. I needed many long miles of continuous elements, and wanted it to be cheap! Thus began my quest for recycled materials and trash! That’s another chapter. This all came by me going back to school after my degree at UCLA to get the practical experiences I needed. I attended Santa Monica City College, and learned drafting. I took rendering at UCLA extension, and classes like alternative architecture. I applied to the Lausanne Tapestry Bienniale in 1974 at the ripe old age of 27. To my amazement I was accepted. 64 people worldwide selected from a pool of 800 give or take. I remember getting the very thick powder blue envelope with red and navy diamonds around it, too fat to get out of my tiny mailbox. I knew that if I were rejected the envelope would have been skinny. My heart pounded out of my throat as I opened this envelope. Congratulations from Claude Ritschard, the director of CITAM. Oh no, Oh no, this isn’t supposed to happen to me till I’m 42, I thought. Some magical age, a mid life career age, when I would be at the pinnacle of my career, and it could be my time to be accepted into the Biennial. The Tapestry Biennial in Lausanne was held in the summer of 1975 (June 14-September 28). I stayed at a little tiny Inn called Hotel du Raisin, which was adorable and close to the museum. My artwork had been shipped weeks in advance in 2 air cargo containers for 1 dollar per pound, a lotta dough in those days, $600. Upon my arrival at the Musée Cantonal des Beaux-Arts, Claude Ritschard, the charming director, introduced me to my “assistant,” a fiber artist visiting from Buenos Aires by the name of Jorge Luis Giacosa. He instantly became my angel and my right hand. He did everything for me, including translations. The Museum had fabricated an 8 foot by 8 foot flat wooden structure which they suspended from the ceiling with wire cables. It swung a little bit, which made me a little dizzy. My job was to arrange and hang crocheted elements from this structure. Jorge and I became fast friends with Lisa Rehsteiner, and her brother Georg. They were Swiss, living in Spain. Lisa also had a huge installation piece entitled Mirage, which she had to mount on the wall and stretch out into space. We worked many hours and days in the museum to install these pieces. We also befriended Kjell Mardon Gunvaldsen, who was teaching me to speak his language. All I remember was tak, thank you. It was pretty mind blowing for me, meeting people from all over the world. 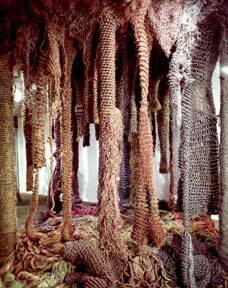 Forest: In the 1975 Lausanne Tapestry Biennial, 10 x 10 x 10 feet, 600 pounds of crochet sisal, jute and manila fiber. The Museum was locked down for lunch between 12 and 2. All the workers in their cobalt blue jumpsuits vacated the building. One day the four of us went out into the plaza where there was a farmers market. We bought bread, cheese, pears and more fruit, and brought it back into the museum, and got locked in, so we could work those extra two hours. We sat in my crocheted Forest and made up all kinds of composed sandwiches in bizarre combinations. I’m sure you can imagine the creativity of a group of hungry artists! One night, for comic relief and rest, we went to a movie in the town of Lausanne. I remember being totally embarrassed that I didn’t laugh at the appropriate comedic moments. The converse of that was weeks later, in Paris where I was watching an American film with French subtitles. I laughed way before anyone else in entire the theatre, now feeling embarrassed from the other direction! The vernissage was enormous, fun and scary. There they all were, the famous Sheila and Magdalena. Jagoda literally did say to me, “You must come to my villa in Dubrovnik.” She was jovial, and very fun. It was easy to tell that this woman was a rascal. I felt young, inexperienced, unworldly, and all agog. Definitely not hip slick and cool, like the older more experienced artists. I was thinking that if I was closer to 42, like most of them. I might fit in a little better. I arrived home to find two signed purchase orders for commissions, a direct result of the Biennial.